The team at Loom & Mill shows how they’re using SmartThings to enhance their business’ efficiency, security, safety, and fun. Want to recreate these use cases in your home or business? It all starts with the SmartThings Hub. Once you have the Hub, here’s how to set up each of the actions shown in the video. After installing a smart lock, you’ll want to select where your home or business is located using the free SmartThings app. 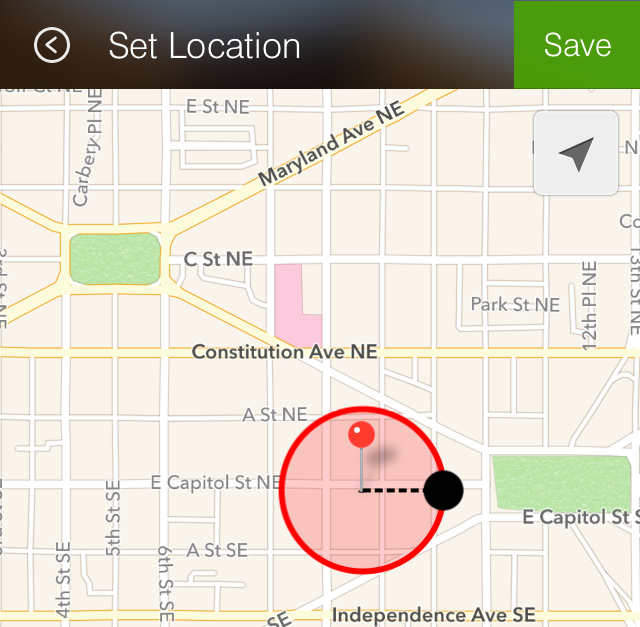 Since all smartphones have GPS sensing built in to them, anytime you enter and exit the geo-fence you’ve selected around your home while your phone is with you, SmartThings can detect that you’re approaching your home/business or leaving it. Next, you’ll want to go to the Actions section of SmartSetup in the app and tap the “Locks” category. From here, you’ll see a few popular options that show how to easily set up use cases with locks. To trigger your door to automatically unlock when you arrive, you’ll want to tap the first prompt. If you need to add a new door, you can give it a name (like “Front Door”) and select whether it’s a conventional door or a garage door. Next, you’ll select your smart lock, and choose the person or people (like co-workers) who you’d like to trigger the door to automatically unlock (this can be triggered via someone’s phone or a SmartSense Presence sensor, as shown in the video). Additionally, if you’d like to only trigger the door to automatically unlock at certain times, then you can tap the More Options option and select certain times of day and/or days of the week. When you’re done, simply tap Next to go to an instructional screen, tap Done, and then you’re all set! In addition never having to fumble around in the dark for a light switch, automating your lights is a great way to live green and help save some green. The team at Loom & Mill keeps a SmartSense Motion sensor in their office facing the door. Whenever the motion sensor detects movement, it triggers a lamp that’s plugged into a SmartPower Outlet to automatically turn on. And when motion stops being detected for a customizable amount of time, the lights automatically go off. To set this up, you’ll use the SmartSetup section of the free SmartThings app to set up a new Action. Under the Lighting header, you’ll see a prompt reading “Turn on when there is motion.” Bingo. You’ll then select the light or lights you’d like to control and select the motion sensor that will trigger the light or lights to turn on. If you’d like to trigger the lights to turn off after people leave, simply select the toggle, and enter in the number of minutes after motion stops when you’d like for the lights to turn off. You can also select this action to occur only when SmartThings is in certain modes, only on certain days of the week, and so forth. Here’s a quick demo video walking you through these steps. Security should extend inside your home or business. Luckily, SmartThings makes it easy to monitor and secure valuable, dangerous, or off-limit areas and to send you an immediate alert if someone is attempting to access it. There are many ways to monitor valuable items or rooms with SmartThings–it simply depends on what’s important to you: The SmartSense Motion sensor can detect movement and send you an alert if there’s unexpected motion; the SmartSense Open/Closed sensor can detect if things like doors, windows, drawers, or cabinets open when they shouldn’t; and the SmartSense Multi sensor can detect when things open and close, but also vibration–such as if someone is knocking or trying to pry open a door or window. The team at Loom & Mill keeps a motion sensor inside their safe. Whenever their safe opens, the motion sensor detects it, and triggers the inside light to come on. However, if it detects movement after regular business hours when no one should be around, it sends Tim and the team immediate alerts on their cell phone telling them that someone is trying to access the safe. To do this, go to the SmartSetup section of the free SmartThings app under the Alerts header. Then, tap Valuables, and select how you’d like SmartThings to monitor your valuables (ie: if something moves, opens, etc). You’ll then be able to name the area or item (ie: safe, jewelry box, cleaning supply cabinet, etc.). Optionally, if you have a FortrezZ Siren Strobe Alarm, you can select the alarm to emit a loud noise and flashing light if the valuable thing you’re trying to monitor is accessed. You can also opt to send a text message to another person as well, and you can select the notification and/or alarm to only be triggered on certain days of the week and at certain times of the day. While standard smoke and CO detectors are great at notifying you of potential threats when you’re already inside your home or business, they don’t alert you to potentially deadly threats when you’re away. Enter SmartThings. By using the free SmartThings app, you can easily get alerts to help protect your family or co-workers, and property wherever you are. Simply access the SmartSetup section under the Alerts header, and select Smoke & CO. From here, you can choose the type of alert you’d like to receive when smoke or CO is detected (ie: a standard push notification, flashing lights, or turning on lights). You can then give the area a name, and choose to turn on an optional FortrezZ Siren Strobe Alarm. The team at Loom & Mill have placed a SmartSense Open/Closed sensor on the inside of their mailbox and receive a notification on their smartphones whenever the mail arrives. As we’ve seen above, it’s easy to trigger a variety of notifications whenever different things happen in your home or business (ie: people coming and going, a door or window opening or closing, motion in a certain part of your business, etc.). To do so, you’ll simply go into the Alerts section of SmartSetup in the free SmartThings app, and then select the type of action you’d like to be notified about. However, things start to get really cool when your Sonos or iTunes speakers (via ObyThing) tell you what is happening. To do this, you’ll want to go into the SmartSetup area of the app, and scroll over to the More header. 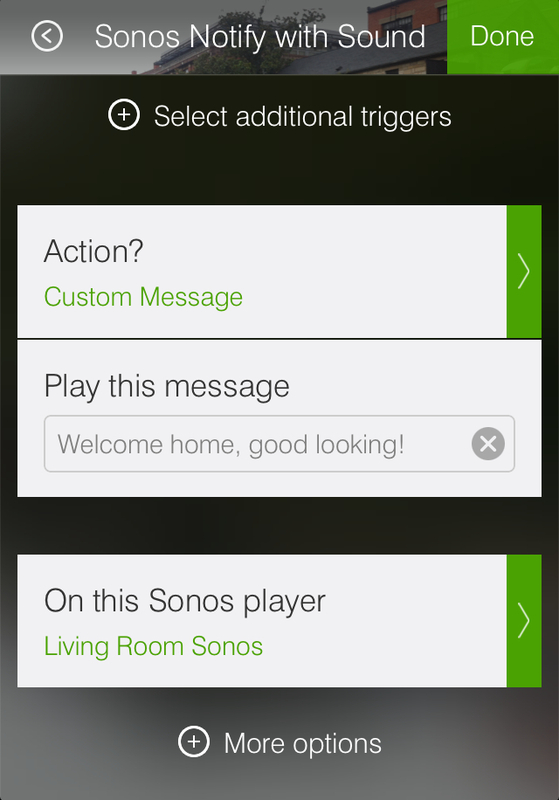 Then, open up SmartThings Labs and select Sonos Notify With Sound. As the name implies, Sonos Notify With Sound can automatically play a variety of preset messages (such as “The Mail Has Arrived”) or sound effects when different actions around your home take place. Here’s a quick video showing you how you can use Sonos Notify With Sound to type in a custom message of your choice to play whenever different SmartThings-compatible devices are triggered. 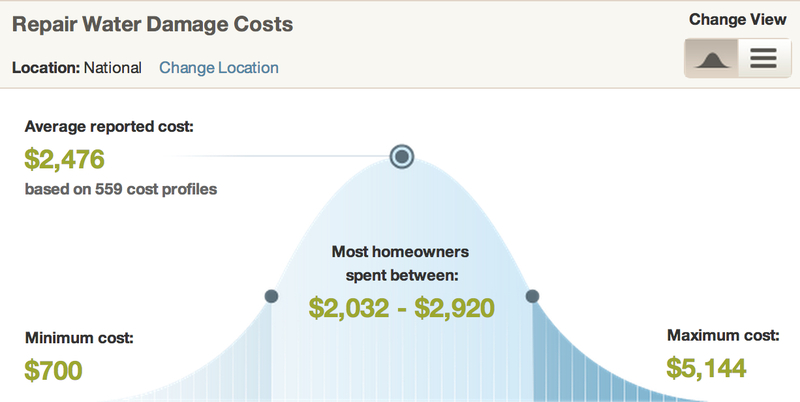 Here’s a not-so-fun fact: According to HomeAdvisor.com the average cost to repair home water damage throughout the country is $2,476. Yea… not cheap. We know that a minor leak can quickly escalate into devastating damage–it’s why we started SmartThings in the first place. In a smart home or business, you can get an immediate alert whenever excess water is detected where it doesn’t belong. And by notifying you of the problem, you can address the issue or call a plumber or co-worker to prevent a headache from costing you a fortune. To learn more about the great people and products at Loom & Mill, check them out on Facebook and Twitter.